Now in its 8th year, the Comms Dealer Sales & Marketing Awards is designed to give ICT channel businesses a unique opportunity to acknowledge the skill, determination and success of their sales and marketing teams. 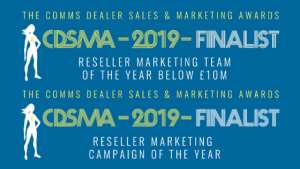 This year, MPS has been shortlisted for two awards: Reseller Marketing Team (under £10m) and Reseller Marketing Campaign. The winners will be announced at a ceremony in London on 2 May. I am particularly pleased that MPS has been shortlisted for these awards. Our marketing is always designed to help our customers keep up to date with important developments, drive process change and efficiency. Want to receive the latest news to help your business grow? Our free monthly newsletter, The Network, is designed to keep you informed of all the latest ICT developments and help you drive process change and achieve efficiency. Sign up today to receive your copy.